How rare are these aerials? 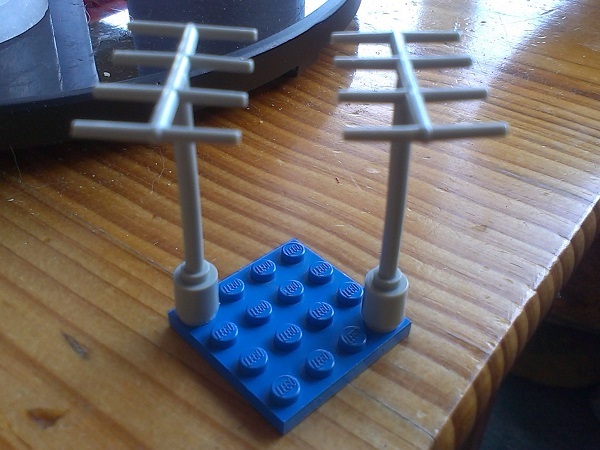 While I was at Brick-a-laide I spotted a few of the aerials pictured below, one of the guys displaying his sets got into a conversation about them, he alluded to them being particularly rare pieces. After mentioning I had several including a few semi-translucent white ones, I had several people offering to buy them (two guys seemed like they were ready to kill each other for the chance to grab one). I've tried looking on Bricklink, eBay, Amazon, but my search terms seem to be failing me for a change. Are these things really worth hanging on to? There's the Bricklink entry for this part. Your light grey ones seem to be fairly rare and valuable! I would guess the "semi-translucent" ones you mentioned are what BL calls "milky white," which seem to be the least-rare of the colors. It looks like yours are in great condition, so great find! I'm guessing the reason they wanted them so badly isn't necessarily because they are rare but they are pricey and were looking for a bargain from a newb. Finding them intact is the difficult bit. Without looking them up I'm sure they were used in lots of the early 'space' sets and I think 'town' as well. I seem to remember them on top of police and fire stations. But as they were from the era when all Lego sets got played with the horizontal bars often broke off. The gray ones were often on more expensive sets and constantly broken so they tend to be more sought after. Especially as they are in many larger classic space sets as well as larger city sets (like a Police Station and Cargo Center) (I have many stored for MOCs or for replacing in a set I'm rebuilding). 2) they appear to be very straight and not bent up like many other are. I was born in '76 & before I was crawling, my parents' family & friends were stockpiling Lego sets for me, so I even have some doubles of some sets. My dad had the attitude that you take care of your toys (else you won't get more), any stuff I've got that's damaged is due to my cousins, I was able to keep them away from my Lego for the most part, so most of the aerials have survived well. I did look it up and your exactly right. The white aerial first appeared in 1969 and was included in many sets until 1973. Light Grey's run was from 1979-1984. Milky white had the longest run as it first appeared in 1976 in set # 565 Moon Lander. I received that set for Christmas that year and it the antenna for the rover moon car. It last appeared in 1987 in a basic building set.